Have you ever wondered how many unique combinations of lock and key there are in the world? Or considered that someone around you may actually have a key that will open your front door? Well, while it technically is possible, particularly if it’s a popular brand of key and lock, the chances are still quite small that you’ll come across someone who can randomly access your locks! Generally speaking, a cheaper, simpler lock will have a smaller range of unique combination. A basic 3-pin tumbler lock can have just over 200 different combinations. This is because of the number of “pins” required to turn the lock. Heavier, more secure or customised locks with have more pins and therefore more combinations available, over 19, 000! The better the lock, the more secure it is, for more than one reason! 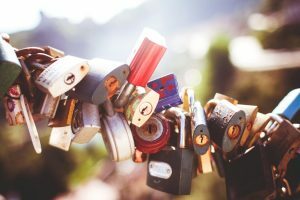 If you want a lock installed correctly and for maximum security, then Out and About Locksmith Canberra have you covered. We can supply and fit locks for every need and desire at competitive prices. Similarly, Out and About always stay up to date with new advances in security and will be able to help you out if you find yourself stuck and locked out in the Canberra-wide area. If you’re thinking of upgrading your locks, get in contact with us today so we can show you how to stay safe and secure! http://www.outandaboutlocksmiths.com.au/wp-content/uploads/2017/02/chain-of-locks.jpeg 750 1125 pippa http://www.outandaboutlocksmiths.com.au/wp-content/uploads/2016/04/247-locksmith-canberra1-300x139.jpg pippa2018-09-19 10:54:242018-09-19 10:54:24How Unique Is Your Lock and Key? Tips For Keeping Car Keys Safe Where Are Our Locksmith Services Located?